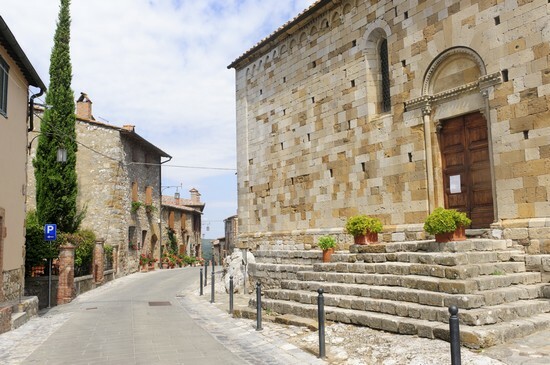 Is a small medieval village (576m above sea level) whose raison d’être is found in the past rivalries between the republics of Siena and Florence; in fact the village was born as a Sienese fortress, against the “Florentine” Montepulciano. The first evidence of the area being inhabited dates as far back the Neanderthal man (approx. 60,000 years ago) with the Lithic tools found in the area of “Il Tondo” (now the public garden). In the following centuries we have accounts of a territorial dispute in the year 715 for the ownership of the church Pieve di San Valentino. The history of the village as such began in the XIIIth century with the foundation of the church Pieve di S. Leonardo by the Cistercian monks from the monastery nearby, who by dedicating themselves to fulling wool gave the village its name Mons a Fullonica. After various events Montefollonico was incorporated into the Tuscan Grand Duchy in 1555.